April Fool’s Day is a great time to introduce, discuss, or reinforce the inerrancy of God’s word with all ages. How? Here are some easy ideas and tips, broken down by age. There are a couple of ways I reinforce the concept of the inerrancy of the Bible on a child-like level each week I teach preschool Sunday School. Try these at home with your family! 1. Every time I tell a Bible story, I have an actual chapter and verse Bible in my lap. No matter what preschool visual or story book I might be holding up, I always point to my Bible and say, “This story is from God’s true Word, the Bible.” Those visual and auditory cues are important in helping young children understand what God’s Word is. 2. During song time, we always do the following two fingerplays. A figure play is simply words said in a sing-songy way with motions. Tip for home: Put these on notecards and keep them around the house so you can learn them and use them frequently with your kiddos. The friend and fellow preschool teacher at church who taught me this next chant says, “We do it while marching, slow stomping through “snow,” fast across hot sand, etc. Sometimes I clap it before Bible story.” Thank you, Julie Bridgeforth! Everything the Bible says is absolutely true! Before moving on to older children . 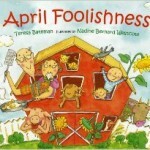 . .
I’m a children’s literature junkie when it comes to holidays, and I simply could not write this post without sharing my favorite for April Fool’s book, even though it has nothing to do with the truth of God’s Word. It’s quite clever and we love pulling it out every year this time! I asked our former Student Ministries pastor for a book recommendation on the subject. 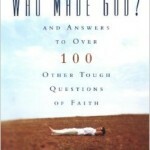 He has used this resource on occasion with our church’s teens: Who Made God and Answers to Over 100 Other Tough Questions of Faith. For more easy ways to find and use God’s word in topical teachable moments, see your copy of Parenting with Scripture: A Topical Guide for Teachable Moments. Kara Durbin is the author of Parenting with Scripture: A Topical Guide for Teachable Moments and has enjoyed continually serving in various roles of children’s ministries for over 20 years. She has a degree in elementary education from Texas A&M University and homeschools her children part-time through a University Model School. Kara, her husband, their daughter and son, and two crazy dogs make their home in the Dallas, TX, area. 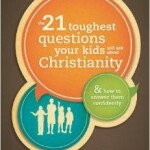 For tips on parenting with Scripture and teachable moments, subscribe to her blog through www.parentingwithscripture.com.